I’m in Karlsruhe in Germany at a three and a half day meeting of the European Mature project. The project is ambitious and brings together many partners from different countries. It also brings tother knowledge managements pecialists and computer scientits as well as eductional technicans. I can’t say I awlays understand what is being talked about – at the moment the talk about core ontologies for interlinking a knowledge bus and semantic wiki is a little over my head. The MATURE project is examining knowledge maturing processes and developing and testing technology based tools to support those processes. The project is based on the idea that the agility of organizations has become the critical success factor for economic competitiveness. Agility requires that companies and their employees together learn and develop their competencies efficiently in order to improve productivity of knowledge work. Failures of organisation-driven approaches to technology-enhanced learning and the success of community-driven approaches in the spirit of Web 2.0 have shown that for that agility we need to leverage the intrinsic motivation of employees to engage in collaborative learning activities, and combine it with a new form of organisational support. For that purpose, MATURE conceives individual learning processes to be interlinked (the output of a learning process is input to others) in a knowledge-maturing process in which knowledge changes in nature. This knowledge can take the form of classical content in varying degrees of maturity, but also involves tasks and processes or semantic structures. The goal of MATURE is to understand this maturing process better, based on empirical studies, and to build tools and services to reduce maturing barriers. One of the key outcomes of the MATURE project is to develop and test a Personal Learning and Maturing Environment (PLME), embedded into the working environment, enabling and encouraging the individual to engage in maturing activities within communities (both established and newly formed) and beyond. Whilst the idea of knowledge maturing is a little difficult to work with, the idea that a Personal Learning Environment (and learning) can be embedded in evereyday work processes greatly interests me. The PLME needs to support interchange and discourses with both formal and informal networks as well as the emergence of these in order to support sociofact maturing. These networks may form part of a wider organisational learning and knowledge maturing environment. The PLME should facilitate users in supporting the learning of others as a significant form of skills and knowledge development. The PLME should provide functionality to facilitate communities in developing collaboratively the tools, documents, routines, vocabulary and symbols that can carry the accumulated knowledge of the community. The PLME should support information and knowledge workers in the requirement to use different sources to obtain current and accurate information, to extracting and extrapolate key data and to interpret and manipulating that data in order to provide a service. The PLME should allow for the collection of loosely coupled tools, both to provide flexibility for the different needs of different contexts and communities and also to facilitate agile development to respond to needs as a when they emerge. Where is the buy-in? Where are you embedding your technology/innovation/practice? Is it technology or practice? Are you planning change or replacement? Change agents – who drives change? Are you targeting the correct stakeholders? Leverage institutional reputation – what are the competitors using? Why would I support you? What problem you solve for you me? I am extremely tired today – travelling from Bremen to Ilmenau for Educamp and back to Bremen, then on to Manchester for a Jisc conference and then to the Plymouth eLearning conference and now back to Bremen was a little overambitious I think. But I have had some great conversations on the way. A longer reflection will require a little time and peace but here are some quick thoughts. The Educamp confernce was remarkable because of the participants. The largest group were teachers and this meant the conversation changed from the wonders of educational technology to effective teaching and learning. And it was the unconferecing format and the i9nformal approach which encouraged so much participation. Also, the fact that it was free. Teachers cannot afford the high registration costs that are charged by the ‘traditional’ elearning conferences such at Alt-C and Online Educa. And so these conferences become dominated by the educational technology community (in the case of Alt-cC) or the corporate elearning market (in the case of Online Educa). This is not to say that these communities have nothing to contribute. But the participation of teachers (and students) makes for a much richer discourse. I presented a keynote in Plymouth. Steve Wheeler said i could be as controversial as I wished. In contrasting Learning pathways to traditional approaches to schooling based on curricula, I questioned the future of educations systems. One of my concerns with this approach, however, is the danger of exclusion. Whilst the introduction of universal education through the Taylorist schooling system was designed to meet the needs of the economies following the industrial revolutions, it did provide opportunities for learning for those previously denied access through income and class background. And moving beyond that industrial model of schooling which now increasingly looks very tired does endanger that right to education. However, the argument seems more complex to me. Although many working class kids have profited from access to school, the forms of organsiation and curriculum have also excluded or alienated others. Research suggests achievement is still class based and access to higher education is still problematic for those on low incomes. Furthermore, as learning moves beyond the institution and becomes distributed in the community through the use of new technologies, it is opportunities to participate in those wider forms of learning that is critical to equity in access to learning. I will try to address this issue in subsequent blog posts. But now it is time for a break – I am off to watch the football! As promised yesterday, some more thoughts on the Educamp09 conference held last weekend in Ilmenau in Germany. The overwhelming memory is of the atmosphere and buzz around the event. much of the reason for this was the superb organisation. Just small things really – a selection of different coffee, cartons of juice available throughout the conference. Great lighting and sofas to sit on to chat. Good music -all that kind of thing. Another thing was the tech. This was not just a conference – it was an event. Every session was streamed out live. The sessions with online presenters worked. Big screens projecting the twitter stream. Very cool. A lot of this was because it was an unconference. Apart from the opening panel discussion and a couple of invited international speakers, all the sessions were negotiated on the Saturday morning. No abstracts, no agonising over whether papers would be accepted. And the programme was simply filled in on the spot on a computer and then projected all over the conference spaces. No fiddling around to find out what session was where (Alt-C take note). And it was run by a volunteer organisation relying on (probably too small) sponsorship for funding. No funding bodies to keep on board, no policy bodies who had to have their egos massaged. A conference for the community run by the community. There were no fees (Alt-C, Educa On-line – take note again). One result of this is that the conference was accessible to students and to teachers. The largest grouping at Educamp were teachers. And that brings another perspective to discussions on technology. The teachers came to share their own experiences and to learn as part of their practice. 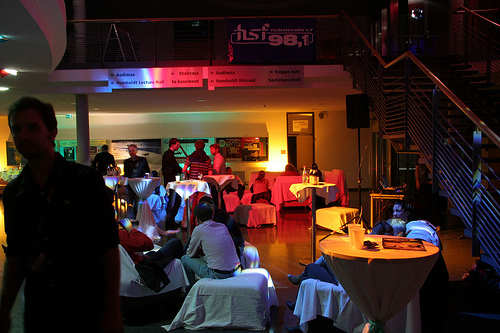 If course the confernce was aided by the growing buzz around Web 2.0 and learning in the German speaking countries. I personally suspect that this is helped by the previous relatively low level of technology adoption in education. there is less baggage in the form of legacy technologies to be overcome. The buzzwords from the confernce were “Bildung Hacken“. What is that? It is a term coming out of the Hacking Education confernce held in New York on March 10. However, Bildung Hacken is not really a precise translation – it means more in German – anyone care to attempt a translation / explanation? The next Educamp is planned for Graz, in November I think. I am planning to be there. But here is a thought. Why not a UK based Educamp – and if we were to hold it at the same time we could link the two conferences electronically. EduCamp 2009 in Ilmenau was cool. Great people, wonderful atmosphere and engaging discussions. I will be posting soon on the vent and what I saw as the major issues emerging from it. enough now to say that it was an event for EduHackers. And of course Sounds of the Bazaar was there with a live Saturday lunchtime show. I think it was the best of the live shows we have done. Despite English being a second language for most particpants, they were queuing up to come on the programme. But don’t take my word for it. Listen yourself to the podcast below. NB Thanks to all the production crew – Helen Keegan, Cristina Costa, Dirk Stieglitz together with myself, Graham Attwell. Thanks to to all the kind people from educamp which made this show so much fun to produce. The music is by Cool Cavemen from their albums Raw und All Cool Hits. Youcan find more great Creative Commons music on Jamendo.com. Using your skills to the full? I have been thinking a lot about the commodification of education. And this job advert from the UK Department for Innovation, Universities and Skills (what a mouthful!) seems to sum it up for me – the bean counters approach to innovation. The Department for Innovation, Universities and Skills (DIUS) is the sixth largest spending department in Whitehall with a budget of more than £20bn. Britain can only succeed in a rapidly changing world if we develop the skills of our people to the fullest possible extent, carry out world class research and scholarship, and apply the knowledge and skills to create an innovative and competitive economy. As part of our team, you will have a key role to play. Posted in Wales Wide Web | Comments Off on Using your skills to the full? I am not convinced about the movement from punk to New Wave. But as I said in my original article, we need to establish edupunk as having a meaning in its own right. The music analogy is getting stretched and has limited further purchase. Jim Groom has also been posting a series of articles showing how the edupunk idea can be practised in education. A silly term, a fad, middle aged white male educational technologists at play? Edupunk has been called all of those but it won’t go away. Why is that? Because edupunk defined by Jim Groom as ” An approach to teaching and learning practices that results from a do it yourself attitude….inventive teaching and inventive learning” sums up the direction in which many of us which to see technology used in education. This week saw the final of the spring series of open web based seminars organised jointly by the UK Jisc funded Evolve network and the German EduCamp organisation. And, appropriately enough the subject was edupunk. “Edupunk is a philosophy deeply rooted in the belief that educators can ‘do it themselves’, and use tools that are open, ‘free’ and non-proprietary. It’s a movement against the commoditization of learning and against corporate profiteering. It is not just about selecting open tools and technologies. It is also about the freedom to choose the methods of teaching that are open and student centred. I would even go as far as to claim that Edupunk teachers should be challenging the curricula they are required to teach, and especially the assessment methods that are imposed from on high. These are the structures that constrain education and stop learners from achieving their full potential. Virtual Learning Environments (VLEs) and in particular Learning Management Systems (LMSs) contribute toward restrictive practices in education and constrain both learner and teacher to operate within a model of learning that is institutionally beneficial, but does little for the learner themselves. VLEs are generally difficult to use, with far too much effort needed to be put into understanding how the system works, to the detriment of the time and effort spent actually learning. An exemplification of Edupunk philosophy is the rise of the personal learning environment (PLE) in which the learner selects his/her own tools and technologies to apply in formal and informal learning. Typical PLEs will incorporate a social networking service, reflective and collaborative tools, e-mail and a mobile device. I use a mashup of wiki (shell to aggregate all tools and provide a collaborative space), blogs (reflective tool and mind amplification space) and Twitter (microblog to update and inform and also to receive ideas and contact from others with a similar interest to me). I also use my wireless laptop and iPhone as communication/end tools. This is interesting. Both Martin and Steve embrace the idea of edupunk. Both are supporting the introduction of Personal Learning Environments. But whilst Steve sees edupunk ” bricolage, anarchy and subversion and a challenge to the establishment” and the VLE as contributing to restrictive practices, Martin is seeking to open up the VLE and apply the ideas of edupunk in an institutional context. He does not appear to see it as subversive or a challenge to the establishment but rather as a way of enhancing the teaching and learning environment. Could it just be that the idea of edupunk is now becoming part of the mainstream and as it does different strategies will emerge? Is it also possible that edupunk is becoming a (valuable) concept in itself without the need to be viewed as an analogy to the punk music scene of the 1970s. I hope so. If you want to listen to the debate the Elluminate replay of the seminar is available on line. I am speaking at the Plymouth elearning conference on 23 and 24 April. Steve Wheeler asked me to produce a summary of my presentation for the conference publication. This was a problem. Firstly, I am bad at writing summaries. Secondly, I never know quite what I will say until I say it. But finally I have sat down and written it. I quite like it. I think it provides a summary of the different ideas around which we are centring our work at Pontydysgu. The presentation will look at the impact of recent developments in social software and the possible impact on education. The origins of the word curricula, coming from the Latin word ‘currere’ – a running race, a course or career can be contrasted to the origins of the word learning coming from the old Gothic word ‘Gleis’, meaning to tack, to follow and to find a path, the Gothic ‘leis’ which means to know and the the old English ‘learnien’ – to get knowledge. a straight line between the two. Above all our educational institutions have been developed around the idea of homogeneity. Such an idea of homogeneity was reinforced by the first industrial revolutions which led to the expansion of a schooling system to develop the skills needed by the workforce in a production economy. The introduction of social software allows the exploration of different learning pathways, and learning through exploring, wandering and funding the way. Social networking tools allow learners to make connections, to take individual choices about the direction of their learning within personal learning networks. Learning is based on bricolage – on making creative and resourceful use of whatever materials are to hand, regardless of their original purpose. Teachers and trainers have a new role as mentors and guides to scaffold and support learning. In terms of the future development of educational technology we need tools to help explore pathways, develop connections and to take control of own learning. This is turn requires a greater degree of engagement between developers, educational technologists and practitioners. Education systems need greater flexibility to provide learners with their own space, to work at their own speed and at their own level, to define their own knowledge areas and make their own connections. Institutions can take the first steps in this by unlocking their resources and opening up their VLEs, by providing more and different ways of accessing services and by focusing IT support on services rather than systems. The emergence of new patterns and forms of learning based on social software provide a great opportunity to extend learning opportunities and to embed learning in every day work and living. At the same time it poses a challenge to educations systems and institutions who no longer have a monopoly on knowledge development and transmission. I was sent an (unasked for) email about a new journal. Academic spam. But there was an article I was interested in. And so instead of consigning the email to my spam box (as I should have) I followed the link – only to get this message. Aaah. Why bother sending me this information if it is not open for me to read. The policy of closed journals is one which has lasted too long. It is time for change </end rant>.